As a professional travel writer and editor for the past 40 years, Don George has been paid to explore the world. Through the decades, his articles have been published in magazines, newspapers, and websites around the globe and have won more awards than almost any other travel writer alive, yet his pieces have never been collected into one volume. 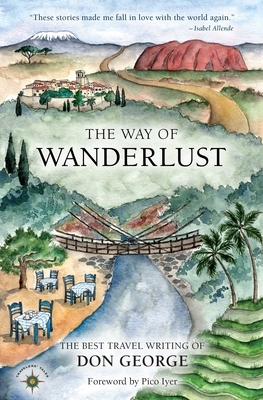 The Way of Wanderlust: The Best Travel Writing of Don George fills this void with a moving and inspiring collection of tales and reflections from one of America's most acclaimed and beloved travel writers. From his high-spirited account of climbing Mount Kilimanjaro on a whim when he was 22 years old to his heart-plucking description of a home-stay in a muddy compound in Cambodia as a 61-year-old, this collection ranges widely. As renowned for his insightful observations as for his poetic prose, George always absorbs the essence of the places he's visiting. Other stories here include a moving encounter with Australia's sacred red rock monolith, Uluru; an immersion in country kindness on the Japanese island of Shikoku; the trials and triumphs of ascending Yosemite's Half Dome with his wife and children; and a magical morning at Machu Picchu. Don George wrote the book on travel writing, literally. His book, Lonely Planet's Guide to Travel Writing, is the best-selling travel writing guide in the world. Don has been a pioneering travel writer and editor for 40 years. He has been the travel editor at the San Francisco Examiner and the San Francisco Chronicle, founder and editor of Salon's "Wanderlust" travel site, and global travel editor for Lonely Planet. He is currently an editor at large and columnist for National Geographic Traveler and the editor of BBC Travel's "Words and Wanderlust" section. Don is the cofounder and chairman of the renowned Book Passage Travel Writers and Photographers Conference. He has visited 90 countries and has published hundreds of articles in dozens of magazines, newspapers, and websites worldwide. He has also edited ten award-winning literary travel anthologies. He speaks and teaches regularly at conferences and on campuses around the world, and he is frequently interviewed on TV, radio, and online as a travel expert. He lives in Piedmont, CA. Pico Iyer was born in Oxford, England to parents from India, and he was educated at Eton, Oxford, and Harvard. He is the author of many best-selling books, including Video Night in Kathmandu, The Global Soul, The Lady and the Monk, and The Art of Stillness. Since 1992 he has been based in rural Japan with his longtime sweetheart, while spending part of each year in a Benedictine hermitage in California.